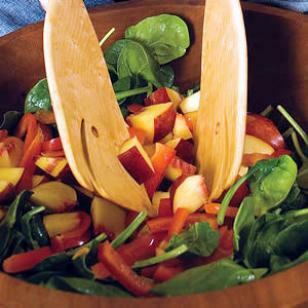 Spinach salad is a great way to increase your family’s fruit and vegetable consumption. We’ve found that a simple, slightly sweet dressing like our Raspberry Vinaigrette, tossed with mild Boston lettuce or a baby spinach salad, with fruit or your family’s favorite vegetables, can convince most everyone to take a bite. Dovetailing Tip: Purchase 6 additional nectarines to substitute and use in the Fresh Peach Trifle for Meal 3. Slice the nectarines and sprinkle with 2 tsp. lemon juice to keep from turning brown.